An example our I-IV-V minor chords are Am-Dm and Em. Note the position. When A is on the 5th fret, 6th string the IV is across one string and the V is up to frets on the 4th. When the A is on the 5th string we need to go down and across two frets to find the IV and up two frets to find the V which is now next to the starting note or root note. This demonstrates where Am, Dm and Em are when playing bar chords. If you are playing in a major key the positions will be the same. 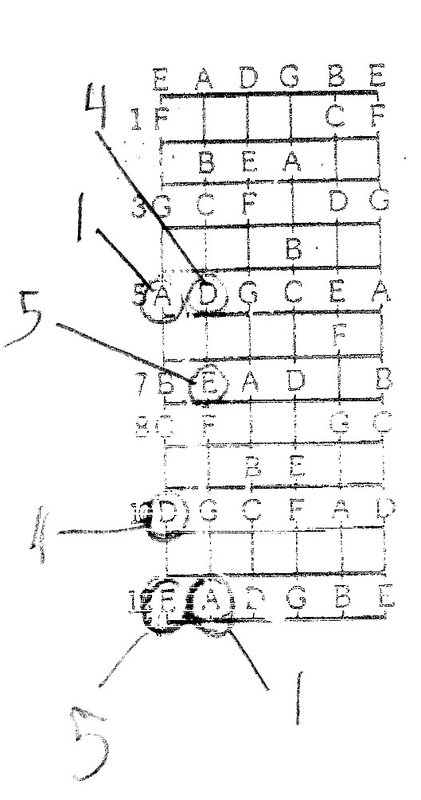 These chords are made up by adding other notes of the scale that can be easily seen if we give each of the notes a number, as we did before.